While Lou began the trip with her sister Janie, Janie was unable to complete the trip. Undaunted, Lou continued on alone. For the next year, she drove from city to city, staying a full month in each location so she could fully experience its culture, people, food, and ambiance. She took exacting notes and lots of photographs. 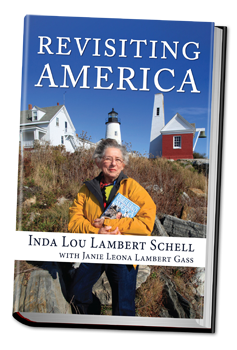 In the pages of Revisiting America you’ll join Lou as she shares snacks with Iggy the Iguana in Key West, dines at the Fat Hen restaurant in Charleston, and takes an intrepid stroll across a mile-high swinging bridge in Blowing Rock, North Carolina. You will also get to eavesdrop as she makes friends from New Orleans to Taos, and Boothbay Harbor, Maine, to Ketchikan, Alaska, ultimately proving to everyone who hears her story that it’s never too late to follow your dream.